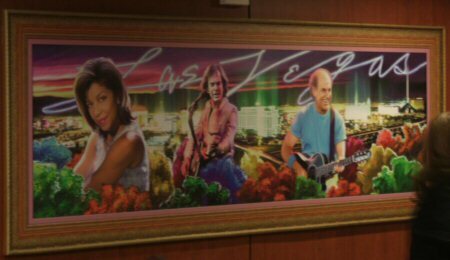 Forget the Bellagio Gallery of Fine Art, check out this beauty from inside the McDonalds between Harrah’s and Casino Royale. I mostly get this. Gladys Knight (left), Celine Dion (centre) and Wayne Newton (right) – none of them have shows in town anymore, but that’s OK. I understand why they would be chosen to be immortalised in a burger joint on the Strip. But who is that staring over Celine’s shoulder? I just can’t figure it out. It’s an amazing picture, but who the hell are they all?